Don't be left without your critical data! RapidBac protects your data from crashes, viruses, disasters, and accidents. With RapidBac, you can protect your data with enterprise-quality backups at an affordable price. Hard drive crashes, viruses, theft, fire, natural disasters and even accidents can claim your critical data. Without a robust backup solution, your financial records, business documents, photos, videos, and more can be lost in the blink of an eye. With RapidBac, there's no need to worry! All your important data is safely backed up and can be restored in a flash! Sometimes it's difficult to know what to back up. Important files can be scattered across various folders, and it's a terrible feeling to discover too late that some of your critical data didn't get selected for backup! That's why we're here to assist in configuring your backup plan, helping to ensure that your critical data is protected! RapidBac provides all the features you need to back up your personal and business data, at an amazingly affordable price. Whether you're backing up your Quickbooks data, personal photo album, or your company's entire database server, RapidBac is up to the job! Your data can be backed up to the cloud as well as to a local USB stick or external hard drive. Make unlimited automatic snapshots of your data, then restore a file to that point at any time! Your archives are never deleted from your account, so you can always roll back to a previous version of your files. with at least 1 offsite copy maintained at all times. Your data is protected with military-grade encryption before it leaves your computer, using a password that only you know. It's simple to recover files! Use the Virtual Drive app and simply drag and drop the files you need. Or, if your computer is completely crashed, use the Bare Metal recovery to boot your computer from a USB stick and restore it. RapidBac takes care of your data so you can focus on what you care about! 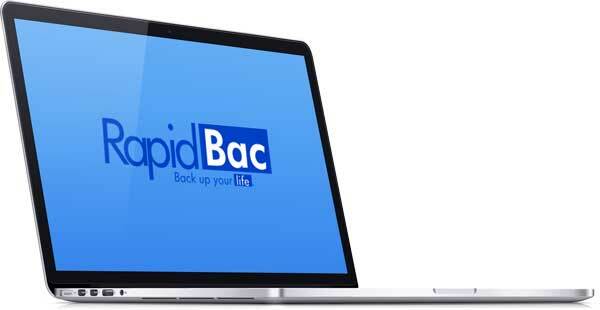 RapidBac makes enterprise backups affordable for everyone, at home or at work! For small datasets, the Per-Gig plan is a great choice. For workstation users, the PC Unlimited plan is an excellent value. For servers, you can't beat our Server Unlimited plan to protect your critical data. For small datasets - back up your critical data for only a few dollars! We look forward to hearing from you! Contact us with any questions - we are always happy to help! © 2015 RapidBac. Powered by Hilltop.